May 2 (UPI) — The Pentagon transferred a detainee out of the Guantanamo Bay prison camp for the first time since President Donald Trump took office, officials announced Wednesday. 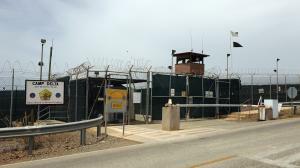 Ahmed Mohammed Ahmed Haza al-Darbi was transferred to Saudi Arabia from the detention center, bringing the number of detainees remaining at Guantanamo Bay to 40, the Department of Defense said. “In a February 2014 plea, al-Darbi pled guilty at a military commission. Now, having complied with the terms of that agreement, al-Darbi will serve out the balance of his 13-year sentence in Saudi Arabia. He has waived his right to appeal,” the Pentagon said. Al-Darbi pleaded guilty to charges related to helping plot a 2002 al-Qaida attack on a French oil tanker. As part of the plea agreement he was ordered to testify against two other Guantanamo detainees in exchange for being allowed to serve the remainder of his 13-year sentence in Saudi Arabia. The Pentagon said the secretary of defense notified Congress of the transfer in accordance with statutory requirements. Al-Darbi issued a statement to The New York Times through his volunteer lawyer, Ramzi Kassem, condemning the practice of sending prisoners to Guantanamo Bay without a trial. Earlier Wednesday U.S. Defense Secretary Jim Mattis issued guidelines stating the United States will continue to send suspected terrorists to Guantanamo Bay if they pose a “continuing, significant threat” to the country.